Meet the canine world’s top dog, the German Shepherd. This German native has made a positive difference to many lives, in more ways than one. Originally bred for herding sheep, its capabilities have expanded. This handsome canine is now a devoted family companion and a well-used service dog as well. Together with the Doberman, Rottweiler and Pitbull, German Shepherds are one of the top choices in guard dog and protection dog duties. Before you welcome a German Shepherd into your family, you must find out if it can fit in. This stoic fellow has an imposing appearance and is usually associated with aggression. You have to engage basic training lessons for your new puppy as soon as possible. Ask about its personality. If you want to volunteer your German Shepherd as a service dog, you will need to know if it has what it takes. The German Shepherd is a dog with well-known, outstanding traits. That said, find out more about him before giving him a place in your home. This dog is as brave as many stories describe him. Early German farmers needed a strong dog that could defend sheep against preying wolves, and it is still bred for this purpose. Its sheep-herding genes continue to thrive. His courage makes him an invaluable companion on the battlefield. A case in point is Rin Tin Tin, who lived from 1918 to 1932. American soldier Lee Duncan, who rescued the wounded dog from the battlefield in World War 1, obtained silent film work for him. He was the draw of many shows and got more fan mail than the stars themselves. Tin Tin, or Rinty, was both gallant and talented. The German Shepherd’s commanding appearance instills fear. This, combined with instances of biting and fighting, makes many people think of him as aggressive. In reality, he has a calm temperament. There are many reasons why any dog may bear his fangs. The behavior could stem from fear or provocation. To add, a dog which is trying to protect its belongings may become edgy and snap. The German Shepherd’s even temperament and alertness, according to scientific researcher Deb Dalzel, allows him to predict epileptic seizures. All dogs have olfactory glands which give most of them a sense of smell that is six times better than a human’s. The German Shepherd has particularly strong ones. Research by Gianluigi Taverna, printed in the Journal of Urology suggests that it is able to detect cancer cells. 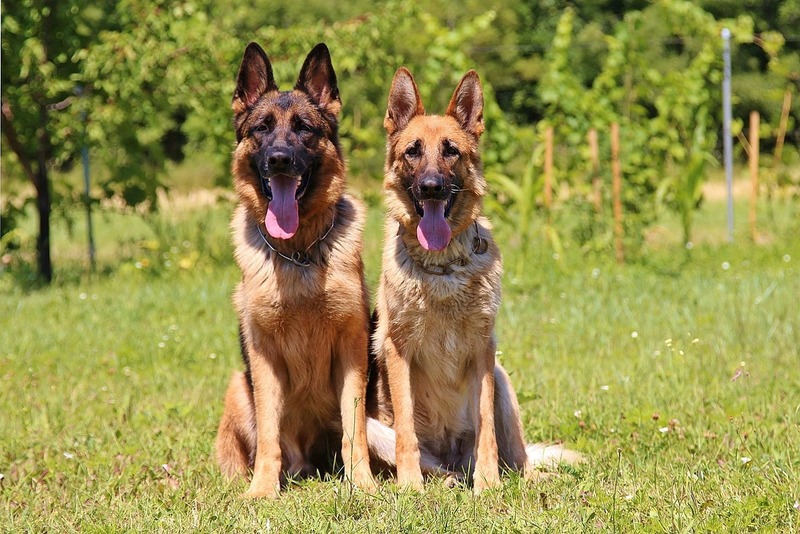 Two German Shepherds, trained as exposive dogs, sniffed cells from 582 patients. Both dogs achieved close to 100% sensitivity when sniffing out metastasized cells. The German Shepherd is fiercely loyal. This quality makes him an esteemed family companion. The faithfulness seems to know no bounds. This dog is on par with the famous Hachiko, an Akita, in terms of faithfulness. Captain, a famous German Shepherd in Argentina, stood guard at his owner’s grave for seven years. The herding and guarding abilities are renowned. Many dog owners value them for their protective instincts. These make him an excellent guard dog. A doorbell is seldom necessary with a German Shepherd in the household. Before you start training your German Shepherd, it is good to know what kind of learner he is. Set your training expectations as well. What kind of learner is the German Shepherd? The superior intelligence of the German Shepherd is well-known. Put him among other dogs in an obedience class, and find him at its head. Stanley Coren, Professor Emeritus at the University of British Columbia, conducted studies in which he confirmed that dogs are as intelligent as 2-year-old children. He based his confirmation on a language development test which showed that the average dog grasps about 165 words, in the way a two-year-old child does. This includes actions and gestures. Smarter dogs know about 250 words. Unsurprisingly, German Shepherds are among this number. Cohen suggests that German Shepherds are one of the the five most intelligent dog breeds, coming in third after Collies and Poodles. This explains why the German Shepherd is a popular pet. Humans tend to gravitate towards dogs that can understand them. It ranks as the second and fourth most popular dog in the United Kingdom and the United States, respectively. This dog draws trainers as well. Sharp as a tack, German Shepherds can master obedience and agility exercises with ease. German Shepherds are easy to train. That said, no training program is effective without awareness of a dog’s needs. Understand this breed’s specific training requirements before you begin a training routine. Being exceptionally intelligent, the German Shepherd needs mental stimulation. He becomes bored easily, and will likely resort to chewing slippers or messing up the sofa if he has nothing to do. Apart from games, stimulate him with puzzle-type chew toys. Food dispensing Kong toys, which force a dog to find ways to retrieve treats, engage him. Use structured obedience as mental stimulation. Obedience training for German Shepherds can start when the dog is about eight months old. The German Shepherd is fully capable of understanding complex instructions, like speaking on command. Like all other dogs, he must master “sit”, “stay” and “heel” drills first. This fellow is a strong dog. In a bite force competition between himself, a Rottweiler and a Pitbull, he does not fail. Even for long road trips, the German Shepherd does not tire out easily. This video shows that he has a bite force of 238 pounds, behind the hefty Rottweiler’s 328 pounds and ahead of the aggressive Pitbull’s 235 pounds. Being strong and easily bored, this big dog is in constant need of a job. Many German Shepherd owners know that their dogs are always looking for responsibilities. Find ways for him to help you. Strap a small backpack on his back, and get him to tote light groceries. Teach him to fetch your slippers for you as well. A dog that fears its owner is a disobedient, wilful dog. Conversely, a spoiled dog is as well. A healthy, balanced relationship between a dog and its owner is essential before any training can begin. When training a German Shepherd, consistency is essential. Make sure that you agree with your family about the words to use to get him to respond to commands. Use single words, and stick to them. Do not reward him for good behavior, and pat his head immediately after. Obedient as he is, the canine of all canines is dominant. Left to his own devices, the competitive German Shepherd may play aggressively with other dogs. It is also important to control its prey drive. Bred at first to manage livestock, it has a strong instinct for the chase. Rein him in if you find him distracted by birds or rodents during training sessions. With a tough exterior, this dog seems hardy and independent. However, he is a softhearted and will not give you a moment alone at home. The German Shepherd develops strong bonds with his owners. He feels the need to protect the family, and will feel disoriented when it is not present. His undying loyalty to you as a pack leader has a flip side. He tends to develop separation anxiety. Counter this by gradually extending the time you spend away from the home. Say goodbye to him, without making too much fuss. This assures him that you will return. Dogs seldom respond well to harsh words, and the German Shepherd is no different. Have treats on hand to reward him for good behavior, but make sure that you do not over feed him. Scour the shelves in pet shops for low-calorie treats. Clicker training, which involves a snap of the fingers when a dog shows the right behavior, is a useful way of reinforcing it. Try a clicker device, which is consistent and produces clicking noises quickly. While positive reinforcement will encourage your German Shepherd to show the right behaviors, it is important to enforce boundaries. With his powerful limbs and strong bite, he can become aggressive. A fully grown German Shepherd can cause serious injury to a child. Train it not to leap on strangers, as their exuberance is easily mistaken for aggression. Teach them to understand social situations. Control your German Shepherd when you are at the park. This is where distractions abound. Always have your dog on a leash, and teach him to react appropriately to other dogs. The German Shepherd has a sensitive nose, with olfactory glands that are more powerful that those of other dogs. Play games that will hone its sense of smell. This is a simple game which will tease your German Shepherd puppy’s nose. Have treats on hand. Place both of them in front of the dog, and ask him, “Hand?” Let him use his nose to nudge the hand with the treat in it. You can make this game harder by getting your dog to use his paw to show you which hand the treat is in. Do not give him the treat if he gets it wrong, as this will not reinforce the behavior. Playing with your German Shepherd in the dark is fun. Show your dog a treat, then place it out of sight in a dark room. Make sure that it is not difficult for your dog to find. Praise him enthusiastically when he comes across it. This game builds trust. If you use multiple treats, the dog may not find them at once. This is when the “seek” command comes in useful. He will believe in the command, and in you, when his persistence in searching for the treat pays off. As he grows older, take him outdoors for tracking sessions. Begin by taking him to a large, grassy area, like a park. Go there before anyone else does. This limits distractions. Leash your dog in an area where he cannot see you. Alternatively, have a family member distract him while you prepare a trail. Make it about six feet away from your dog. Drop small treats, each about six feet apart, along the trail. Press the treat against your shoes to capture its smell. Press into the grass for the same reason. Place one of your belongings on top of it. Walk about ten feet perpendicular to the trail, then back to your dog. Guide him to the trail. He should find the first treat quite easily. Encourage him as he finds each one. After your dog masters finding treats along a straight trail, let him find treats along complex, figure 8 tracks. Bring him to areas where he has to find treats among items with other scents. This will make him pay attention to the treat’s smell. Does the German Shepherd make a good service dog? The German Shepherd is the ultimate service dog. It lends a hand to people in many ways. His guarding instincts make him an ideal police dog. Law enforcement agencies all over the world use German Shepherds for many purposes. Their resilience, strength and keen noses make them perfect tracking dogs. They search for drugs, bombs and missing persons. Well-trained dogs can tell if substances are on a person or his belongings. Firemen use German Shepherds to search for survivors or cadavers. He makes an excellent “seeing-eye” dog because of his tracking abilities, balanced temperament and willingness to connect with people. Sam Herbert, who is visually handicapped, shares how Faith, his guide dog, interacts with him. The devoted dog, who is in a harness before he gets up, pulls at him when a car is in his way. She also leads him around objects. She uses “intelligent disobedience” to let him know if an object is blocking him. If one does, she does not move, despite his instructions. He touches lives. His sharp, emotional sensitivity makes him an ideal therapy dog. Jason Hayes, a war veteran who suffered from PTSD after two tours in Iraq, describes how his German Shepherd, Axl, enriched his life. He was on 32 different medications before his interactions with Axl, then a therapy dog with K9 for warriors. Doctors decreased his dose to two medications after Axl came into his life. If you need a dog to protect and serve, a German Shepherd is the dog for you. German Shepherd Training may take some time, but when you develop that close relationship with your German Shepherd, all the effort is worthwhile.